Taylor Oyster Bar delivers the freshest Pacific Northwest Shellfish from their very own Taylor Shellfish Farms to the table. Enjoy oysters, clams, mussels and more with beer, wine or otther beverages that perfectly complement the bright, clean, distcinctive flavors. Visit Taylor Oyster Bar in Pioneer Square for happy hour, a pre-dinner appetizer, a late-night snack, or a special treat whenever. Taste their carefully raised specialty foods and experience what Taylor Shellfish has perfected the last 100 years. 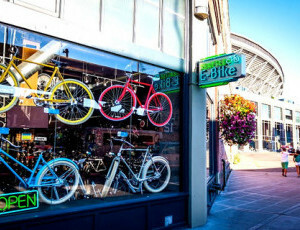 Seattle E-Bike strives to provide eco-friendly alternatives for transportation in Seattle. Sprout offers Seattle a healthy alternative for lunch and dinner. Sprout is good from Patch to Plate- good for the earth and good for you.